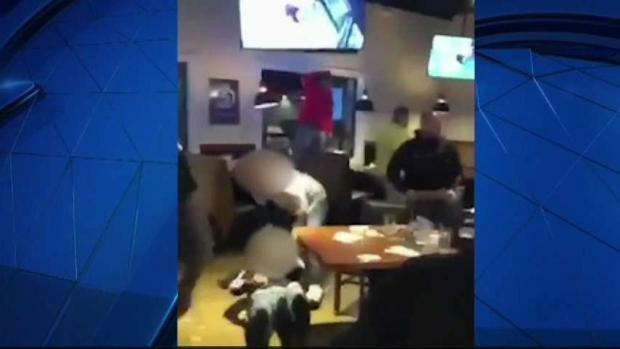 Police are seeking the public's help in identifying the people involved in a massive bar brawl in Methuen, Massachusetts over the weekend. Video of the fight shows shattered glass flying everywhere, with a man on the ground after taking what appears to be a glass or beer bottle to the head. Then someone in a Red Sox jersey heaves a chair and starts to throw a flurry of wild punches. One woman can be heard screaming in the background. 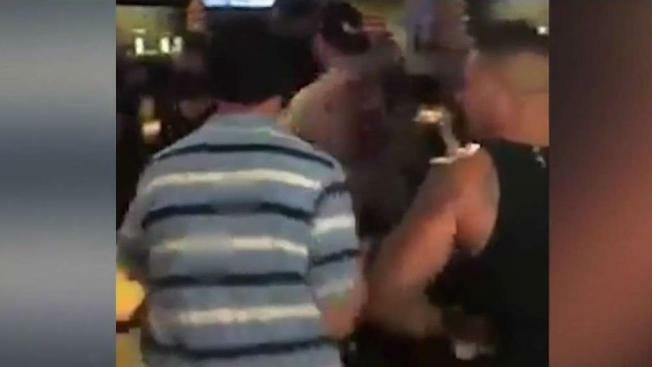 Part of this violent melee was captured on cellphone video late Saturday night at the Brickhouse Tavern + Tap in Methuen. The bar was packed for an Ultimate Fighting Championship match on television. "It was just chaos, no other way to explain it," said Methuen paramedic Matthew Coco, who got the emergency call with his partner Saturday night. "The beer going everywhere, the chairs being thrown, and it was pretty intense," he said. Police said a 33-year-old Lowell man was treated at a local hospital and released. They are not releasing his name at this time. "He received stitches for minor lacerations and obviously he'll have some issues with teeth being knocked out," Methuen police Capt. Jim Jajuga said. "We did speak to the victim and some of his friends," Jajuga said. "They could not identify any of the assailants on scene." It's unclear what may have triggered the brawl, but authorities say so far no arrests have been made. Jajuga said they have some leads and are continuing to investigate. He said at a minimum the charges will include assault and battery with a dangerous weapon. "We are following up with the public, and we would implore them to please assist us in identifying some of the subjects," he said. The owner of the Brickhouse Tavern + Tap says it does not condone this behavior and they are saddened by the actions of a few of its patrons. Police say a few people in the video could face charges.